If you have a fireplace in your home and have ever started a fire and forgot to open the chimney damper, you know how quickly things can go bad as the room fills up with smoke. While maybe not as dramatic and visible the same thing is happening in our homes if we are not using the ventilation systems properly. Local ventilation is a very important component to your overall indoor air quality. Maybe a better term for it is localized ventilation as it is locating a fan where it is most needed. As with our fireplace analogy, the chimney is located right over where the fire is burning. I think we can all agree that it doesn’t make much sense to put the chimney in another room. Local ventilation is placing exhaust fans in area such as bathrooms, kitchens, powder rooms and other places that are producing contaminates. The purpose of local ventilation is to remove harmful moister, particulates, odors and more as they are occurring. 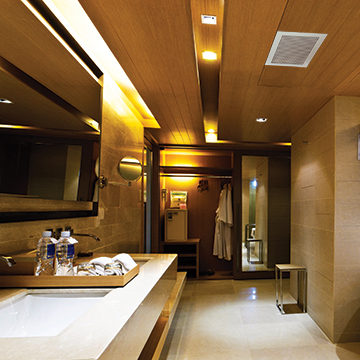 In a bathroom for instance local ventilation removes steam and moisture from the room that happens during a shower. In a kitchen it is utilizing a range hood when the cook top is being used. ASHRAE 62.2 requires that there is an exhaust fan/range hood installed in any area that produces contaminates (bathrooms, kitchens, in some cases laundry rooms, etc.). ASHRAE also requires the fans to operate at or below 3.0 sones (which is a measurement of sound). Many people ask what the sound level of a fan has to do with exhausting contaminates. As we have discussed in earlier posts, the sound level of the fan is important to the usage of the fan. It comes down to the fact that if the fan is too loud, homeowners will not turn it on which defeats the entire purpose of having the fan. In a previous blog post we discussed continuous operation fans (see post). While the continuous ventilation continuously dilutes contaminated air within the home, the local ventilation provides ventilation for times when there is a rapid build up of contaminates such as what happens when the bathroom or kitchen is in use. The good news is there are many options on the market. Air King has one of the largest selections of exhaust fans and range hoods to solve for local ventilation including energy efficient models, virtually silent models, single and dual speed models and options ranging from entry level cost effective to super deluxe with all the bells and whistles you want. Visit www.airkinglimited.com for more information.